Exercise bikes commonly referred to, as stationary bike is probably the most popular home exercise equipment. The best part about these stationary exercise bikes is that they help in developing aerobic capacity while at the same time lay limited impact on knees and leg joints. Exercise bike is one of the best bets to reduce obesity as well as maintain good health. Another advantage of having these bikes is that you have the option of exercising at any time of the day and during any weather conditions. You can exercise listening to music or while watching your favorite soap within the cozy comfort of your home. Buying a quality exercise bike is a good one-time investment option, as most of the bikes need very little maintenance. With very little care you can continue to exercise and enjoy good health for a number of years. These bikes are not too heavy and easily portable hence can be easily shifted from one place to another. You can choose from basic models of stationary exercise bikes which cost a couple of hundred dollars, to the latest and most modern range which would cost you more than a couple of thousand dollars. You can also go in for a used exercise bike as a trial option. Plenty of bikes are available for sale through online stores, garage sales and on auction. If you are lucky, you may land up buying a bike for less than $100. Of course, this also depends on the type of model you choose. If you are a regular exerciser or a fitness freak, then ensure that you invest in the latest model. But if you are new to exercising and are not sure as to how much you will use it, then it is best to purchase a basic exercise bike model. Another advantage of the exercise bike is that, unlike other exercise equipment, it is simple to use. Adjustable seats and handles ensure that these bikes can be used by practically everybody, irrespective of their height or size. Exercise bikes come in two types, upright exercise bike and recumbent exercise bike. 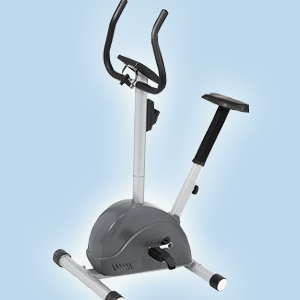 The upright exercise bike resembles any normal road bike except for the fact that it is stationary. The pedals are positioned below the rider and you need to pedal on it like you would any normal road bike. The seats of these bikes do not have any support or back rest. Some upright bikes are dual action bikes with moveable bars and arm handles. In these types of bikes you can tone your upper body and arms as well. In contrast, the recumbent stationery bikes have pedals, which are in front of the rider. The seats are also wider and more comfortable with back support. As you have to pedal in front of you, there is less pressure on the joints and there is adequate support for the lower back. Recumbent exercise bikes offer heart-rate control features that allow for automatic adjustment of intensity keeping in mind your target heart-rate zone. The type of bike you choose will depend on the type of work out you are planning to do, any specific medical condition and of course, your budget. If you are planning a cardio workout with emphasis on the quadriceps, then you can opt for the upright exercise bike. If you are planning to work out your biceps and triceps, you can select models that have handles simulating rowing motion. Alternatively if you are planning to work out your hamstring muscles and also want to remove pressure from your back, you can opt for the recumbent exercise bike. All these bikes come with various levels of resistance to suit the needs of beginners as well as advanced bikers. Different levels of resistance provide for varying degrees of workouts. Some bikes feature manual resistance adjustment while others have preset programs. The computerized console panel is another added feature, which provides vital information such as calories burnt, speed, distance, time, exercise level, pulse, heart rate and resistance level. When buying an exercise bike, especially an upright one, do check out the quality of seat. Some cycles have plastic seats that are too small and uncomfortable. Remember that biking is a low impact workout and hence you may need to sit for a longer time in order to get a good workout. Hence, always opt for a cycle for comfortable, large seats with capacity to accommodate heavier riders. Bikes come with different types of resistance, direct tension, air resistance and magnetic resistance. Bikes with direct tension offer you the option of manually adjusting the level of resistance. In air resistance, riders get to pedal against the air flow of a fan blade. Magnetic resistance is the best of the lot wherein magnetic currents tend to create and track resistance. Most of the upper range exercise bikes operate on magnetic currents allowing for a greater level of workout. Riders also get a more even feel when pedaling. A healthy mind resides in a healthy body. And what better way to exercise than to sit in the comfortable seat on your recumbent exercise bike with your favorite book in your hand and pedal away to a slimmer and fitter you. First Published Date: Nov 17 2006 Last modified Date: April 23 2019 This page may have been updated recently as new information is available or the content may have been edited for better readability.